Recently, I’ve been working with the San Francisco County Records at <a href=”http://www.familysearch.org” target=”_blank”>FamilySearch.org</a>. This collection includes marriage licenses, certificates, and record indexes covering roughly 1906 to 1975. This week I located the marriage license of Carl Koch and Winifred Meincke. Winifred was born in 1886 to Mary Ann (Kelly) and Frederick Meincke. Carl was born in 1887 to Katherina (Beck) and Ernest Koch. Winifred graduated from Mission High School in 1903. Both Winifred and Carl lived with their parents in an apartment building at 19 Cotter in San Francisco in 1910. Winifred worked as a stenographer for a wholesale company. Carl work as a moulder at the foundry. The couple was married on the 12th of January 1915 in San Francisco. 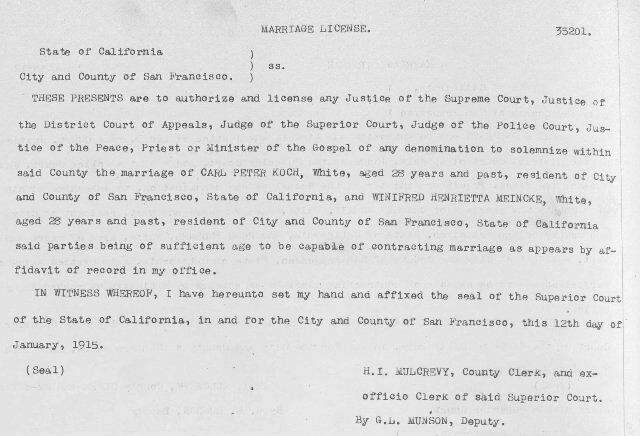 This is the first part of the marriage license that was on file in the San Francisco County Records Collection. It sets out the legal contract of marriage and states that with the license they may be married by any of the officials recognized as being able to legally perform marriages. The first part of the record gives their basic information. The license shows that they were of the legal age to take out a marriage contract. The number in the upper right hand corner, 35201, is important. This is the number of the marriage affidavit that is on file. The affidavit was the equivalent of a marriage certificate. The second part of the license tells us that Winifred and Carl were married on the 12th of January 1915 by John. J. Hunt at St. John’s Church. St. John’s is a Presbyterian church. It has an interesting history. It was founded in the 1860s on Post Street. In 1888, it moved to California and Octavia. There was talk of disbanding the church at the turn of the century. Instead, the congregation was moved a third time to the Richmond District. The first service in this new location was held on 15 April 1906, just days before the infamous earthquake struck. The church was heavily damaged and needed extensive repairs. There are some neat photos of the original churches on their website. According to the website, in the 1930s the church became a haven for those seeking food and jobs. It remains at the same location today. It’s interesting to note that they were married on the 12th, but Mr. Hunt requested that the record by recorded on the the 18th of the same month. I do not know if this delay was normal. From what I’ve seen, people got married within a day or two of getting their marriage license. 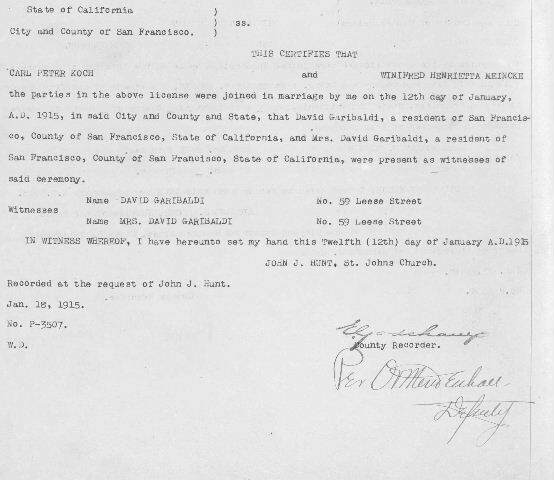 The document also tells us who the witnesses were: Mr. and Mrs. David Garibaldi. This was Winifred’s sister, Frances, and her husband, David, who were married just two months earlier. This document tells us a little bit about the married couple, but doesn’t provide some of the details that are on a marriage certificate. Notably missing are the names of Winifred and Carl’s parents. Now that I have the marriage license I can look for a marriage certificate or affidavit. That number at the top of the document will definitely come in handy!